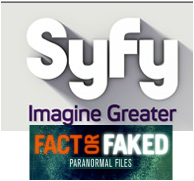 NEW YORK – October 27, 2011 – Syfy’s hit series Fact or Faked: Paranormal Files rose 30% among Adults 25-54 (782,000) and 16% among Adults 18-49 (750,000) during the Wednesday, October 26 telecast, compared to the Season 2.5 premiere on October 19. From 10-11PM (ET/PT), Fact or Faked: Paranormal Files also delivered 1.4 million total viewers, the second most-watched episode of the series ever. From 9-10 PM, the Ghost Hunters lead-in scared up 1.7 million total viewers, while rising 17% in Adults 25-54 (927,000) and 5% in Adults 18-49 (839,000) versus last week’s October 19 episode. Syfy’s 31 Days of Halloween fright fest will culminate in the annual Ghost Hunters Halloween Live telecast on Monday, October 31 from 7PM-1AM/ET, hosted by Josh Gates (Destination Truth). This year, Jason, Grant and team members from both Ghost Hunters and Ghost Hunters International will head to Pennhurst Asylum in Pennsylvania, a sprawling maze of buildings constituting a former state mental institution. Abandoned for decades, Pennhurst is now one of the country's most notoriously haunted locales. Syfy is a media destination for imagination-based entertainment. With year round acclaimed original series, events, blockbuster movies, classic science fiction and fantasy programming, a dynamic Web site (www.Syfy.com), and a portfolio of adjacent business (Syfy Ventures), Syfy is a passport to limitless possibilities. Originally launched in 1992 as SCI FI Channel, and currently in more than 98 million homes, Syfy is a network of NBCUniversal, one of the world's leading media and entertainment companies.